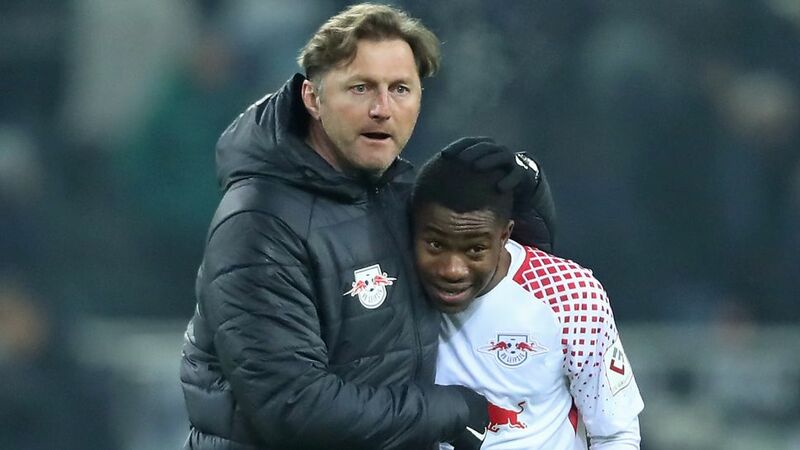 Ademola Lookman etched his name into RB Leipzig folklore by scoring the only goal on his debut against Borussia Mönchengladbach on Saturday, but head coach Ralph Hasenhüttl has claimed the England youth international was fortunate to still be on the pitch to net his 88th-minute winner. Lookman, who joined the eastern club on loan from Everton on the final day of the January transfer window, entered the fray in the 78th minute of RBL’s Matchday 21 victory but had difficulty keeping his footing on the slippery BORUSSIA-PARK surface. For superstitious reasons, the 20-year-old had only packed a single pair of football boots when he swapped north-west England for east Germany last week. Lookman was determined to wear the boots on his debut for the 2016/17 runners-up, but his 'lucky' footwear very nearly scuppered his chances of making the scoresheet on his maiden Bundesliga outing. "He was lucky I left him on," Hasenhüttl told kicker following his side’s narrow win. "He was losing his footing a lot. He wore [his boots] in training yesterday and was just sliding all over the place. He was slipping again today and I wanted to take him off just before he scored, but luckily we kept him out there!" With two minutes of normal time remaining, Lookman collected the ball 30 metres from goal, skinned two Gladbach defenders and sent a clinical finish past Tobias Sippel and into the net, making the London-born striker the first Englishman to score in Germany’s top flight since Owen Hargreaves netted for Bayern Munich in August 2005. "He took his goal exactly how I hoped he would," said Hasenhüttl. "He has so much quality in one-against-one situations. He showed that again today." "I'm happy to make my debut and to top it off with a goal is fantastic," a delighted Lookman told bundesliga.com afterwards. "The win and three points is the most important thing, so I'm happy. "I think we played well as a team, kept possession well, played in between the lines. When I got the call to come on, I was just thinking of how I could make an impact, and thank God I did."